Today we talk about the San Antonio Spurs. Welcome back to Corner Stats! It’s time to talk about my San Antonio Spurs. After a tough start and a horrible November, December was the month of improvement. Let’s analyze what are the reasons behind this resurrection. The Spurs season started earlier than the others: the serious injury suffered by Dejounte Murray has partially changed the season goals of the Texan team. The idea of the management was to give the team keys to the peculiar point guard and to continue the path of growth and consolidation of his leadership. The not-signing of Tony Parker was also aimed to guarantee more space and responsibility to Murray. All of these plans obviously fall down after Murray’s injury. Furthermore, Derrick White, the point guard backup, and Lonnie Walker, the rookie with great potential, were added to the list of injured players. In other words, the Spurs hadn’t point guard at the first of the regular season (Patty Mills aside) and with the necessity to build new lineups. 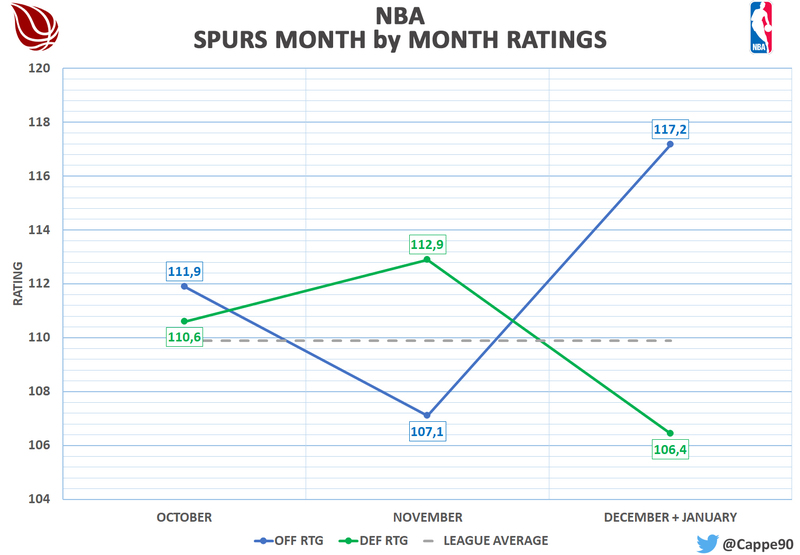 The defense improved after November, but most important improvement was recorded in the offensive side: if the Defensive Rating has an improvement of 6.5 points per 100 possessions, for the Offensive Rating is 10.1 points per 100 possessions. The point is that, until December, there were not very good defenders in the roster, especially perimeter ones. Without Murray, the best defensive player was Mills, but more for the energy contribution than for technical ability. However, at this moment Derrick White can be added to the list of the good defenders; now he has found the physical condition, he is also during a good job in defense: as far as I have seen the feeling is that he improves his defensive effort after he is going in the zone but durting all the matches he is providing a good defensive effort. This tendency can be found throughout the entire Spurs roster: the most recent examples are the first quarter against the Raptors or the third quarter against the Celtics. When San Antonio has started to go off on the offensive side, even the defense has improved. In any case, this growth within single games starts from a much better level than in previous months. All this is quite anachronistic: San Antonio has always been a team that builds its own victories first of all with the defense. Last season is a perfect example: San Antonio made up for Leonard’s absence completely relying on Aldridge, but in first place with the defense. 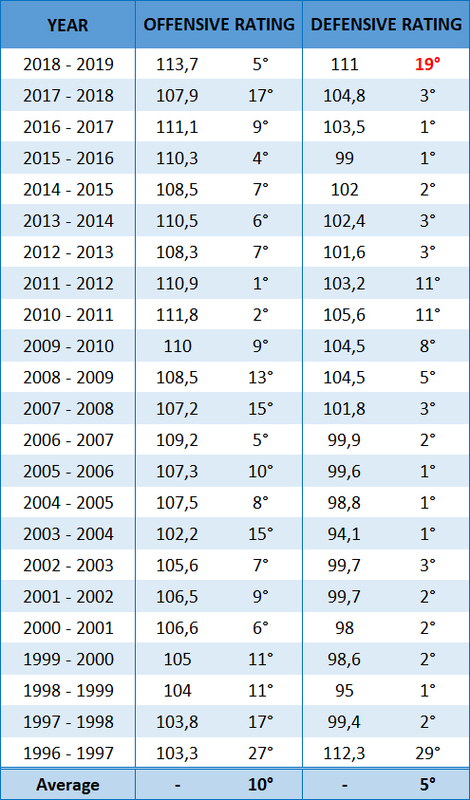 In that season the attack was the 17th for Offensive Rating, while the defense was 3rd regarding its efficiency; this year we are in the opposite situation. On the other hand, Pop has seen two of the best perimeter defenders of the NBA (Leonard can be considered the first ever) leaving Texas during the summer for DeRozan, who is an excellent go-to-guy but a not-so-good defender; so Pop has needed more time to rebuild the famous Spurs defense and, most important, new players to build around the defense. With White at 100% of his condition, the attack is running at full speed and the defense has improved too. He has the best Net Rating on the court: in other words, in this period Derrick is fundamental for the Spurs. 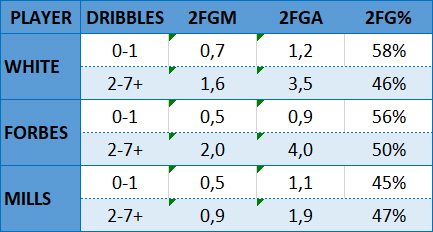 Forbes instead has not yet reached a positive balance, but thanks also to the performance of his teammates, he can give a good contribution from the bench, especially with his 3 point shot. White has essentially the same Mills’percentage with 2-7+ dribbles, but with a much higher number of attempts; Forbes also has excellent values, but his real potential lies in the catch and shoot: 67% of eFG% in this dynamic, better statistics for example of Belinelli (50%) and Mills (61%). White’s comeback has therefore given to the Spurs offense more dangerousness from dribbling: this is not only important for the conclusions at the rim but also to generate defensive rotations that lead to free players. Until the Spurs attack had relied solely on Aldridge’s post and Derozan’s creativity it was quite predictable, but more offensive options were created with White. In addition, White has provided to the starting five of Sant’antonio a very good defensive effort: some defenses on Irving or Leonard are perfect examples. White and Forbes are two examples of how Pop manages to get something good from each of his players: the initial conditions did not allow him to work in the best way, but now we begin to see the true potential of the two players. Probably White is playing above his real potential, but as long as he keeps going in this way the Spurs will have fewer problems. now we have to keep an eye on Lonnie Walker: in the matches played in the G League after his injury he showed excellent athleticism and, in the last one, he scored 34 points.